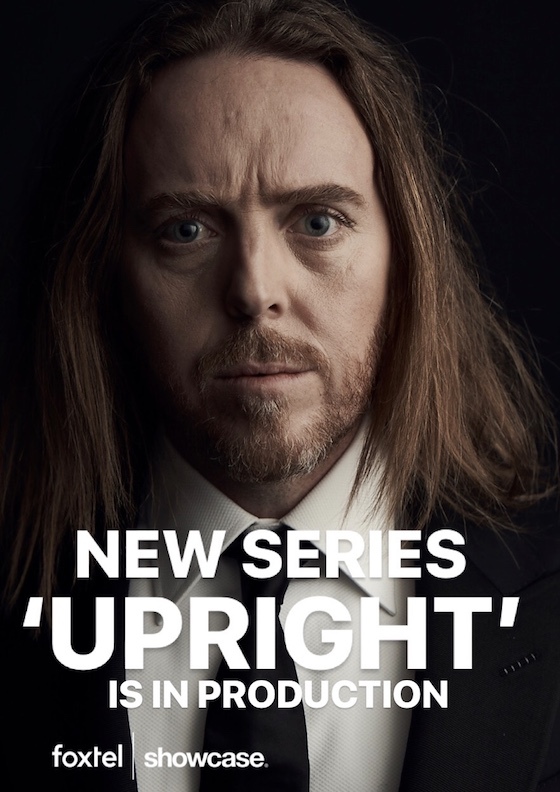 Tim Minchin · ‘UPRIGHT’ – A landmark new series starring Tim! 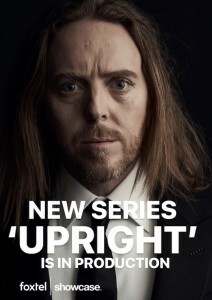 ‘UPRIGHT’ – A landmark new series starring Tim! Tim’s signed a major production deal with Foxtel and today, along with Screen Australia, they announced his starring role in UPRIGHT, a landmark co-production with Sky UK.. He’s co-producing, writing the music and co-writing the script for the eight-part series, sure to resonate with Australian and international viewers. There’s a stellar team behind UPRIGHT, including the creator Chris Taylor (The Chaser) with whom Tim is writing the series alongside award-winning writer-actors Kate Mulvany (Fighting Season, Jasper Jones stage play) and Leon Ford (Offspring, No Activity). The Director is Matthew Saville (Please Like Me). Tim is Executive Producer with Penny Win and Helen Bowden. Producers are Lingo Pictures’ Jason Stephens, Chris Taylor and Melissa Kelly (Hounds of Love). UPRIGHT tells the story of two misfits, thrown together by chance in the middle of the Australian desert, who forge the unlikeliest of bonds in their quest to get a precious piano from one side of the country to the other. Lucky Flynn (Tim) hasn’t spoken to his family in years. He’s broke, distant and damaged. He’s also a gifted pianist, whose talent for music is matched only by his talent for self-destruction. When he learns that his mother has only days left to live, Lucky sets off in a hire car to drive the 4000 kilometres from Sydney to Perth to say goodbye to her, taking with him his only cherished possession in the world – a battered and scarred upright piano. But what should have been a straightforward drive across the Nullarbor soon becomes a test of Lucky’s emotional fitness, when he (quite literally) runs into Meg (Milly Alcock), a hilarious, tough-as-nails teenager, who we soon discover has plenty of scars and secrets of her own. UPRIGHT is a Lingo Pictures production for Foxtel and Sky UK, with major production investment from Foxtel and Screen Australia in association with the South Australian Film Corporation. Financed with support from Create NSW and Screenwest. Rest of world sales are being handled by eOne. I was lucky enough to be selected as an extra in this series and working alongside of this team especially Tim was truly eye opening to the film industry. So much work and dedication goes into film making and i enjoyed it immensely. Thankyou again for this opportunity, a must see series. So glad to hear this. You will absolutely rock thisTim. Knock ‘em dead. I live in Western NY and wish to pre-order a video recording of this series!